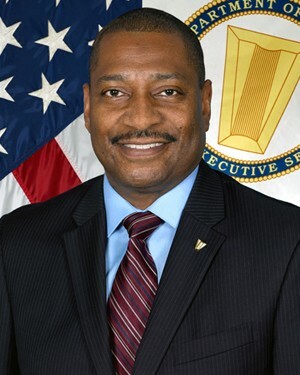 Dr. Eric L. Moore is the Director of the U.S. Army Edgewood Chemical Biological Center (ECBC), the primary Department of Defense technical organization for non-medical chemical and biological defense. He is an expert in chemical and biological defense programs and medical countermeasures, and is a former Army officer. As the Director of ECBC, Dr. Moore oversees many of the Nation’s key chemical and biological defense research and engineering projects, both classified and unclassified. In this role, Dr. Moore builds partnerships across DOD, other government agencies, industry and academia to enhance Warfighter readiness and response to chemical and biological threats. Prior to his roles at ECBC, Dr. Moore served as the U.S. Department of Defense Science and Technology representative to the Public Health Emergency Medical Countermeasures Enterprise Chemical Integrated Program Team. In this role, Dr. Moore coordinated federal efforts to enhance chemical threat preparedness from a medical countermeasure perspective for several government organizations. CST/CBRNE: What are some programs RDECOM ECBC is pursuing to improve capabilities in chemical and biological protection and detection? Dr. Moore: When we talk about the ability to make immediate impacts on Soldier chemical and biological protection and detection capabilities, we’re generally talking about forensic threat assessment, equipment upgrades, and Soldier training. RDECOM ECBC is very active in all of those areas. Forensic threat assessment is the process by which we analyze the intelligence coming in from the field regarding chemical and biological threats operators are seeing. These could cover anything from the use of chemical agent in Salisbury, U.K. to the discovery of a clandestine laboratory anywhere in the world. We analyze that intelligence to determine the nature and scope of the threat and to identify immediate and long-term countermeasures to the threat. That information, in turn, is shared with operators in the field so they have the very latest information about hazards they may encounter. Threat assessment information is also one of the elements driving the process by which we upgrade our existing chemical and biological protection and detection equipment. For example, if a squad of Soldiers discovers a clandestine laboratory, that lab could be making anything – drugs, chemical agent, biological agent, explosives. Each of these threats requires the Soldiers to react in different ways. So what tools can we give them quickly to help them make the right decisions? One already fielded at the unit level is the Joint Chemical Agent Detector (JCAD). Soldiers in the field are already proficient with this handheld chemical agent detector, so rather than create an entirely new device we developed an upgrade to the JCAD to allow it to detect explosives and drugs. The upgrade is a cradle into which the existing JCAD fits. The cradle contains the additional electronics and software needed to detect the additional threats. The familiar JCAD remains at the heart of the system. The upgrade is currently under evaluation. Once we’ve assessed the threat and determined what the appropriate countermeasures are, we need to train the Soldiers. That’s where our Advanced CBRNE Training Team comes in. They provide the connection between our RDECOM ECBC subject matter experts and the CBRNE Soldiers in the field. The team visits units in the field to help the Soldiers understand the science behind the threats they may face and the protection and detection equipment they use. The end goal is to teach Soldiers to think critically, to use the knowledge and equipment at their disposal to assess and mitigate those threats. CST/CBRNE: What other equipment upgrades is RDECOM ECBC working on that users could see soon? Dr. Moore: One of the most significant equipment upgrades we’re working on is the upgrade and integration of sensors on the Nuclear Biological Chemical Reconnaissance Vehicle (NBCRV). The NBCRV is a Stryker vehicle outfitted with a suite of chemical, biological, radiological and nuclear detection, warning, and sampling equipment to provide NBC reconnaissance on the battlefield. We’re working in concert with the U.S. Army Chemical, Biological, Radiological and Nuclear (CBRN) School; the Communications Electronics Research, Development and Engineering Center (CERDEC); and the Tank and Automotive Research, Development and Engineering Command (TARDEC) to remove obsolete sensors and replace them with updated, integrated, externally mounted sensors. We’re also adding an externally mounted Deep Purple unmanned aerial vehicle equipped with a suite of chemical and biological sensors that can be launched and controlled from inside the NBCRV or by a Soldier miles away. We’re also integrating an unmanned ground vehicle equipped with the same suite of sensors that will function as a companion to the NBCRV, allowing an NBC reconnaissance crew to cover more ground, and to literally be in multiple locations at the same time. This upgrade involves much more than just sensors, it’s about integrating the Soldier with those sensors to allow the Soldier to conduct standoff detection through the use of advanced robotics. We’re also currently working with our partners at the Joint Program Executive Office for Chemical, Biological, Radiological and Nuclear Defense (JPEO-CBRND) to upgrade the mobile laboratories used by Soldiers in the National Guard civil support teams across the country. These laboratories contain a full suite of analysis equipment to support the complete characterization of unknown hazards so that the Soldiers can identify CBRN agents and substances, assess current and projected consequences, and advise decision makers on response measures. The first two upgraded mobile labs will be going into testing in the spring. We’re also currently fielding software upgrades to the Dismounted Reconnaissance Sets Kits and Outfits (DR SKO), a set of mission-specific tools that significantly improves the Soldier’s capability for detection and identification, personal protection, equipment decontamination, marking, sampling, and decision analysis and reporting. The upgrade effort will provide Soldiers with the latest information and increased capability for mission execution and success. CST/CBRNE: Chemical and biological weapons are global threats. How is RDECOM ECBC involved in the global response to these threats? Dr. Moore: We work side-by-side with our international allies whenever a CBRN crisis occurs anywhere in the world. When the incident in Salisbury happened, I was immediately on the phone with folks in the United Kingdom, and we’ve continued to provide our best people to support our British partners as they’ve gone through the investigative and remediation process after that incident. When the international community was seeking a solution to Syria’s declared chemical warfare material, we provided the technology, the expertise and the people to destroy more than 600 tons of Syrian chemical warfare material at sea in 2014. We also provide support directly to the Organization for the Prohibition of Chemical Weapons (OPCW). Our Forensic Analytical Center is one of fewer than 20 laboratories worldwide designated by the OPCW to provide environmental and biomedical sample analysis to confirm the presence of nerve agents or other chemical weapons. We work closely with our allies to improve capabilities to benefit both the U.S. and our allied partners. For example, an international partnership with the United Kingdom has brought a new chemical and biological protective suit testing capability to the U.S. Department of Defense. The capability comes in the form of a fully articulated mannequin equipped with several hundred sensors. The mannequin, known as Porton Man, is used to test protective suits against live agent. It was developed by U.K.’s Defence Science and Technology Laboratory and an RDECOM ECBC scientist working at DSTL on an exchange program. Together, they spearheaded the efforts to adopt the technology for U.S. protective suit testing. From a remediation perspective, our Chemical Biological Application and Risk Reduction (CBARR) unit performs operations around the globe. From support to the United Nations Special Commission in Iraq to the assessment and monitoring of chemical warfare agent storage and destruction sites in Albania to sampling and removing contaminated equipment from a former facility in Australia, the CBARR team is a global remediation response force for chemical and biological hazards. CST/CBRNE: What technologies are you exploring today that could shape tomorrow’s battlefield? Dr. Moore: One of the emerging technologies we’re excited about is synthetic biology. It has the potential to enable us to make tremendous advances in support of the Soldier. Synthetic biology offers the potential to unlock new types of materials by harnessing the natural abilities of living systems, such as self-assembly, sense-and-respond, and molecular-scale control and patterning. For the Soldier, these new materials could produce uniforms or vehicle coatings that automatically detect and respond to chemical and biological threats, new unpowered detection technologies that dramatically shrink logistical burdens, and systems to produce chemical and biological countermeasures on demand in the field. Today, we are developing paper tickets embedded with cellular machinery that change color in response to a range of threats — from chemical and biological agents to explosives to water contaminants. This technology is one of the most mature applications of synthetic biology in the world, with other research organizations having demonstrated detection of Ebola and Zika virus in this highly fieldable format. We anticipate that within the next five years, synthetic biology applications in chemical and biological threat detection will become mature enough to start transitioning into the acquisition process. Looking forward to the 10-year mark, we expect that novel materials derived from synthetic biology will start to be incorporated into deployed systems. And within 20 years, we believe smart materials with life-mimicking properties such as sense-and-respond and self-healing will start to be incorporated into deployed systems. We are positioning ourselves to be a leader in this rapidly developing field through our Biological Engineering for Applied Materials Solutions Program. Within this program, highly interdisciplinary work between biologists, chemists and engineers is being performed with the goal of developing our existing researchers to work in synthetic biology. Through lectures, laboratory competitions, coursework, visiting scientist opportunities, NRC post-doctorate hires, and scientific communication workshops, we seek to develop a team of world-class synthetic biology experts. A world-class workforce demands state-of-the-art infrastructure, so we’re planning laboratory infrastructure upgrades to better support advanced research initiatives in the development of synthetic biology materials. Planned research initiatives include novel materials for obscuration, DNA as an adhesive, biosynthetic additive manufacturing, and 3-D printed materials with spores. Even as we focus our synthetic biology research on chemical and biological defense, we recognize the tremendous benefits it can bring to the Soldier in other areas as well. The capability to rapidly grow limbs, the technology to 3-D print organs, the ability to grow ballistic protection – these all have tremendous potential impacts for the Soldier. And while such capabilities fall outside our Center’s mission space, our research certainly overlaps with that of our sister laboratories charged with exploring these areas. Our ultimate vision is to make RDECOM ECBC a leader and resource for all government laboratories in the area of synthetic biology. Metal organic framework research is another area that is showing great promise. These compounds, first discovered in 2000, have the ability to neutralize chemical warfare agent with exposure to light, and we’re working now to find ways to incorporate these compounds into fabrics and textiles. Doing so would enable us to imbue Soldier’s uniforms and other worn items with inherent decontamination capabilities, which would improve protection while reducing the load and logistics burdens. Another area we’re very excited about is virtual and augmented reality. In the chemical biological defense arena, we’re already using virtual and augmented reality as training tools for CBRNE Soldiers. For example, we have created virtual WMD laboratories to familiarize CBRNE Soldiers with scenarios they may encounter in the field. The potential applications of augmented reality on the battlefield are tremendous. Soldiers could wear sensors that recognize chemical and biological threats, as well as other threats such as IEDs, environmental hazards, and so on, and project those threats onto heads-up displays. And then we integrate those heads-up displays into Army tactical networks to let each Soldier see the threats being detected by the sensors that fellow Soldiers are wearing. All that data is then fed to the small unit level, and up the chain until every threat detected by every Soldier in a theater of operations is being captured; Add in the data being captured by manned and unmanned vehicle-borne sensors, point sensors, satellite imagery and detection, then you can compile and analyze it before it’s sent back through tactical networks to aid decision makers on the battlefield. That is how you shape tomorrow’s battlefield, and we’re laying the foundations for all of it today. The U.S. Army Research, Development, and Engineering Command (RDECOM), Edgewood Chemical Biological Center’s (ECBC) parent command, recently transitioned from the Army Materiel Command to the Army Futures Command. As of February 3, 2019, RDECOM was renamed the Combat Capabilities Development Command (CCDC) and ECBC became the CCDC Chemical Biological Center.